When you can’t attend SDCC, you usually spend the next couple weeks anxiously anticipating the exclusives from the show making their way to you. That’s how I’ve spent the last few days. Starting with the middle of last week and continuing into this week, I’ve come home every day to find a new package on my doorstep. I don’t normally pick up as many exclusives as I did this year, but SDCC seemed to offer a neverending supply of interesting things this time around. You’ve already seen my review for the Ghostbusters Video Games Minimates and He-Ro. Today, ItsAllTrue’s SDCC Exclusive Week brings something a little different: Akkuli from the Four Horsemen’s Seventh Kingdom toy line. If you’re not familiar with Seventh Kingdom, it’s an independent toy line created by the renowned Four Horsemen. It was originally part of their Fantastic Exclusive program, where fans can vote for their favorite design (as well its articulation, scale, weapons, etc) and see it get made into an action figure. A Seventh Kingdom character won in each of the first two contests and the toy line was spun out to make it’s own brand. 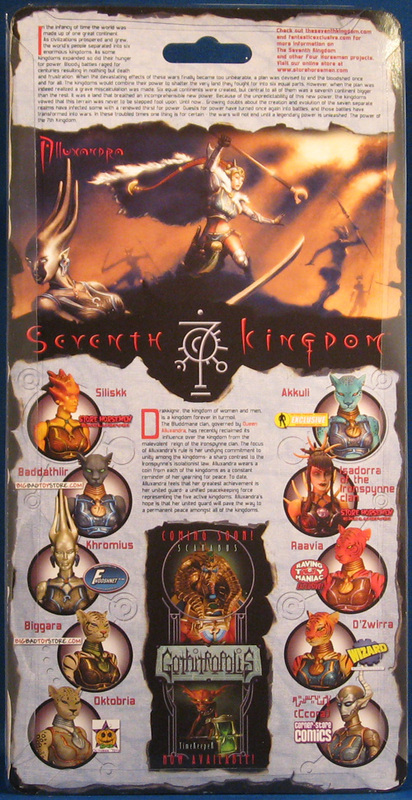 Akkuli is one of the eleven figures that compromise Seventh Kingdom’s first release outside of Fantastic Exclusive and the third release overall. She was available through sponsor site AFX and at their booth in San Diego. She was the first of the wave to sell out. Each wave of Seventh Kingdom figures is based around one original concept (this time, it’s Queen Alluxandra – reviewed by Michael Crawford here). That figure is then redesigned with slightly different armor, accessories, or body parts to make unique characters. Akkuli was the first cat character built around the Queen’s base figure and proved popular enough with sponsors that five more cats were produced! Despite their being six cat variants, Akkuli still gets props for being the first though. We don’t know much about her character yet. The shared cardback gives some biographical information for Alluxandra, so we’re left a little unsure of what role Akkuli plays other than serving the Queen as a warrior. Akkuli’s sculpt features the basic articulation that fans voted on for the previous two releases of Seventh Kingdom figures. Starting at the bottom, she features rocker joints in the feet, pin ankles, double pin knees, thigh swivels, ball-jointed hips, cut waist, ab crunch, cut wrists, double pin elbows, bicep swivels, ball-jointed shoulders, and a ball jointed neck. Whew! They really pack it in over there at the 4H studios. And she’s a solid figure too. Any problems with loose joints that past FanEx figures might have had appears to be gone. In terms of sculpt, she reuses most of the Queen’s body. Akkuli features bare arms, paws for feet, a tail, and obviously, a cat head. The figure is a great sculpt with little details from head-to-toe. From the multiple earrings, the detailed armor, the texture on the tail and feet, she just looks like an action figure at it’s finest. Her sculpt does interfere with the articulation in a few places though. For aesthetics, the figure has a “skirt” piece that’s part of the design. The sneaky Four Horsemen surprised me. I had expected the “skirt” to just be the low-hung purple armor, but everything between the royal blue belt and the purple “skirt” armor is one piece – the parts where you think you can see Akkuli’s blue skin are simply painted to match the figure. While I was impressed by the way the skirt was done and agree the figure looks better for it, it does hinder the articulation underneath and prevents some wider-stanced poses. I may take an exacto and cut some lines into the skirt to increase her poseability. Her cat head doesn’t make as much use of the ball-jointed neck as the other Queen figures seem to, but it moves enough that I’m happy with it. If you want to extend the range, you can always pop her head off and remove her necklace. I’ve never had paint issues on an Fantastic Exclusive/Seventh Kingdom figure and Akkuli is no exception. From the tiny details on the armor to the multitude of black/blue spots that cover her, she’s sharp. And those spots? There’s just not on the front or the most visible surfaces. You’ll find them on her back, her tail, her feet – anywhere they would logically be. No skimping there. The paint app I was most surprised by was one I almost missed. The bottom of Akkuli’s feet are sculpted and painted. The feet are still flat to allow for posing, but it’s another nice touch on a superb figure. Akkuli features a sword and staff like her fellow figures. The sword is identical to the others, but features a black hilt. The staff features a spearhead. One thing that never seems to fail with me and Fantastic Exclusive figures is that I inevitably break an accessory no matter how hard I try not to. I got the spear out of the package without issue and even got two pictures with it, but while setting her up for the third shot the peg for the spearhead broke off from the staff, leaving me two pieces. It’s something I can fix with some super glue, but be mindful of the staff accessories if you pick these up. Either because of the hard consistency of the plastic or the thinness of the peg that hold the two halves together, the staff ends up being weak at the joint. Take caution when handling it. In terms of scale, Akkuli fits right in with most toylines in the 6″ range. I have her pictured with the DC Classics Wonder Woman to show how’d she compare to other mass market toy lines. Now the other figures in the Seventh Kingdom are much larger, but the scale is consistent. They’re hulking man-cows and upright elephants afterall. She does seems a little small next to them, but as Seventh Kingdom grows and we get more human, alien, machine, or mutant characters the scale should even out. Overall, I was looking forward to some of the other variants more than Akkuli, but as I got her out of the package and posed her for the pictures she managed to make me love her. You can’t beat Four Horsemen detail and Akkuli is right in line with their previous releases. With the sheer volume of Classics (MOTU, DC, Ghostbusters) product coming out, I wasn’t sure if I could invest in this round of Fantastic Exclusive, but getting this figure and having her with my cows and elephants is weakening my resolve and I’ve already found myself poking around at the various sites where the other figures will be available (Click Here for that List). Like all Fantastic Exclusive characters, Akkuli is a great design. She sports a well-executed figure and I’d be remiss if I didn’t give her front-of-shelf status. The white ones are tempting. Ccora is my most anticipated right now. I’d never heard of the Fantastic Exclusive, but it sounds really cool. Are all the figures as well done? Yes. The first year was the Mynothecean cows which I still consider the best of the line so far. They’re some of my favorite toys. I’m not into furries, but I have to say that’s a better looking toy than most of what Hasbro and Mattel are putting out. she looks excellent!! can’t wait to get my girls! I had 2 of these on pre-order but cancelled realizing how similar these releases were going to be. Just a head swap and different paints. I couldn’t justify the high price for each of these, even if they are limited.